This week end I stopped by the Seattle Gaming Retro Expo to check what was there. As usual a room full of vendors (prices where not too bad, just like eBay), I went from booth to booth and try to see as many game I think of getting one day, touch then with my bare hands. 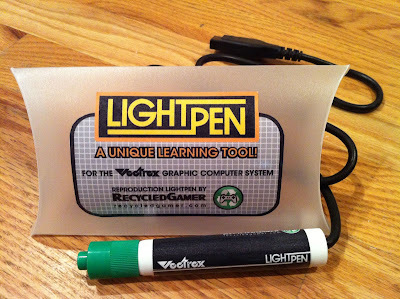 I am getting a multicart of my Vectrex soon (it's in the mail), and I really want to try the drawing game, but the original pen is quite rare and too expensive on eBay. I found schematics on how to build a homemade one, but I am not too handy and I am pretty sure I will kill many of them before I can make one that actually works, or fit in the pen's case. I knew that Chuck from RecycledGames would be there, and he was, surrounded by hundreds of vintage games, his booth was the most fun and cheap too. Not sure what to expect (he knew he built pens a year ago but apparently he had run out), I nervously asked, and he answered that he still had 2, my lucky day. I got one ($40 compared to how much it would have cost me to buy a soldering iron and supplies for 9 broken light pens to come...) and I left happy as can be. Overall a nice hour spent there, I which there was more stands and some kind of museum to see truly rare stuff, maybe for the next time. There was a room full of consoles with a stand at which you could borrow every NES game possible, kind of cool if you are dying to play a specific game, but it was never full. i guess people don't go to these events to play Tengen Tetris on a NES, me neither.